This week’s Extreme Couponing Tip is on knowing where to find hidden coupons! 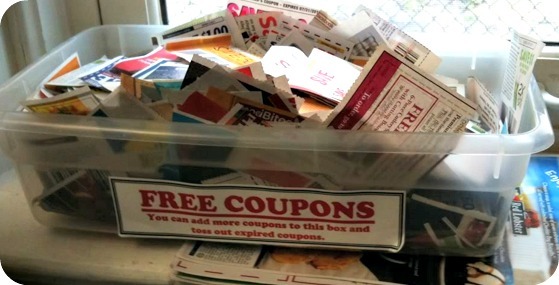 You’d be surprised at all the various places you can find coupons outside of just the typical newspaper insert or Internet Printable ones. Begin to keep your eyes peeled and know where to look to find more FREE coupons that will save you and your family so much money! At the Doctor’s Office: Look on the counters, in the waiting room, in magazines, or even ask the receptionist if they currently have any coupons to hand out from manufacturers. At Convenience Stores: You can often find some great manufacturer’s coupons at various convenience stores–peelies, tear pads, hang tags, etc. Keep your eye out and consider saving the coupon to use where there will probably be a better price on the item at one of the big grocery stores. At the Post Office: Most people will pick up their mail and leave the inserts laying around or even throw them out. Next time you are at the post office, give a quick check at the tables near the post office boxes. You never know what you might find. Inside Product Packages: Keep an eye out for advertisements on product packages promoting “valuable savings or coupons inside.” These can often be some really great coupons to use on our next purchase. In Your E-Mail: A perfect example of this was the $0.50/1 Kellogg’s Waffles Coupon we received from Kellogg’s via e-mail recently, that made for FREE Eggo Waffles at ShopRite! Coupons that come in your e-mail from companies are often ones with specific print limits and therefore cannot be posted publicly on this site, which is why they might be considered “hidden,” however remember to check your e-mail often for coupons from the products you subscribe to! Through Subscribing to Free Samples: I would say 9 times out of 10, a Free Sample that arrives at my house comes with a coupon for the product. This is a great way to not only enjoy Freebies, but also save with coupons on products you might buy in the future! Within the Aisles of Your Store: Always keep a lookout for coupons throughout your local grocery store…blinkie coupons, tear pads, peelies, hang tags, etc. Please, however, never take an inappropriate amount of coupons from the tear pad or blinkie machine. You should really only try to avail of these coupons if you’re buying the product. On Facebook: Nearly every manufacturer out there now has a Facebook page. Be sure to find and “like” your favorites on Facebook to know about the latest coupons & promotions they might have available. Where have you found a coupon unexpectedly? Crocs, Kohl’s, Home Depot Coupon Codes & More!